Following the article 'Calculating Heading Angle Or Bearing From GPS coordinates', in this article we discuss on how to calculate the GPS coordinates of the destination point, with start point coordinates, heading, and distance are known. For more details, please see the image below. ‘a’ is the heading angle, with 0 degree points north of the map, 90 degrees is east, 180 degrees is south, 270 degrees for west, and 360 degrees is equal to 0 degree or the north. ‘r’ is the distance from start point to finish point. 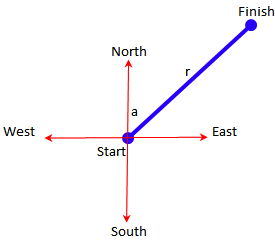 If start point is known, then the end point or finish or destination can be calculated. Download here for Excel document that contains formulas to calculate automatically. Please note the sequence of latitude-longitude coordinates, not to reverse. Google Maps uses a system of latitude and longitude (y and x), instead of as usual in mathematics longitude and latitude (x and y). Heading at start and at finish are not always the same, especially for long distances. If we are near the equator, heading at start and at finish point can be almost the same. It is because of our position to the north and south pole are always about the same. For example a flight conducted along the equator toward the east (heading 90 degrees). As long as that aircraft is on the equator and towards the east, whereever its position, the north pole is always on the left, and the south pole is always on the right. But for flight over the pole, for example the north pole, heading at the beginning of flight is 0 or 360 degrees. When passing over the north pole (90.0), the heading will change to 180 degrees. As flight pass over south pole (-90, 0), the heading will change back to 0 degree. So heading is not constant, although that flight is in a straight line circling the globe. For example: a flight from Pulkovo International Airport, Saint Petersburg, Russia (59.800278, 30.262500). After taking off from Saint Petersburg, Russia; initial heading toward 0.147 or to the north. Flying to a distance of 6,570.679 km. If those data of starting point, initial heading, and distance are inputted on sheet 'end and midpoint'. Then the end point will be calculate at coordiantes (61.17417, -149.99833) the Ted Stevens Anchorage International Airport, Alaska, United States of America. When approaching Anchorage, heading is changed to 179.844 degrees or South (final heading). Even though the flight is along a straight line, to get the shortest distance. So to clarify the flight path, it is needed to calculate also the Mid point, ie the point in the middle of a trip, coordinates are (89.309101, 36.265637). Direction of flight at this midpoint is 6,130 degrees. Example for the region near the south pole: if you are flying from Wellington International Airport, New Zealand (-41.326698, 174.806857). After takeoff the aircraft will head 134. 528 or southeast. Flight distance of 8,569.730 km will at the end point (-41.438512, -73.094015) El Tepual International Airport, Puerto Montt, Los Lagos, Chile. Final heading is 45. 586 degrees before landing. Or heading to the northeast. This flight has midpoint at (-57.631250, -129.216744) near the south pole, the heading at that midpoint is 90 126 degrees or heading east. Example to the equator: flight from the Supadio airport (-0.14735, 109.402585), Pontianak, West Kalimantan, Indonesia. After take off heading o 91. 920 degrees or to the east. After flying as far 19,173.059 km, will arrive at coordinates (-0.113333, -78.358611) the Mariscal Sucre International Airport, Tababela, Metro Quito, Ecuador. Final heading is 88 078 degrees or to the east. That equator flight has mid-point at (-1.925201, -164.477443) near Jarvis islands, and heading to 89 983 degrees or to the east. So for flight along the equator, heading almost always constant around 90 degrees. Earth radius used is 6,378.14 km, which is radius of the earth at the equator. Earth radius value can be adjusted for better accuracy, because the earth is not perfectly round. If using the average value of the earth hass 6371 km radius. While the Earth's polar radius is 6,356.7523 km. When using Google Maps, coordinates of calculation result can be copied and paste in the Search box on Google Maps, then press the Search button. Google Maps will show the intended point on the map.